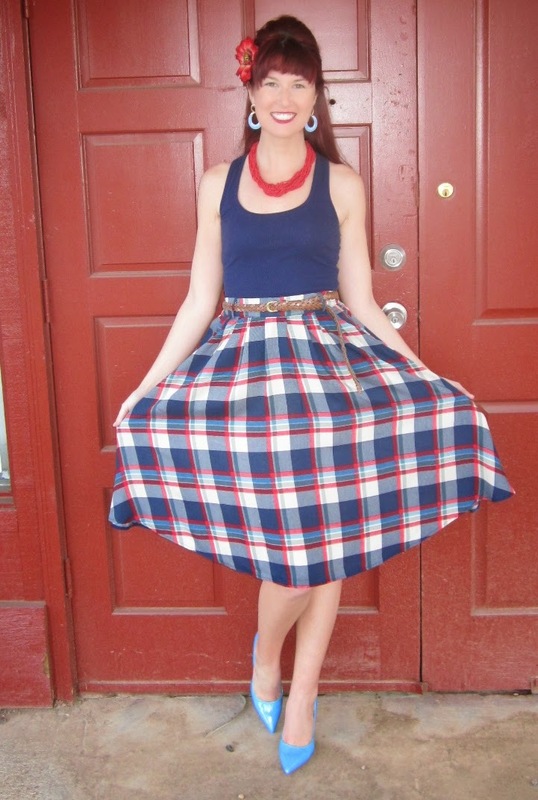 There's a few prints I'm cautious of, and plaid is one of them-at least in skirt form! 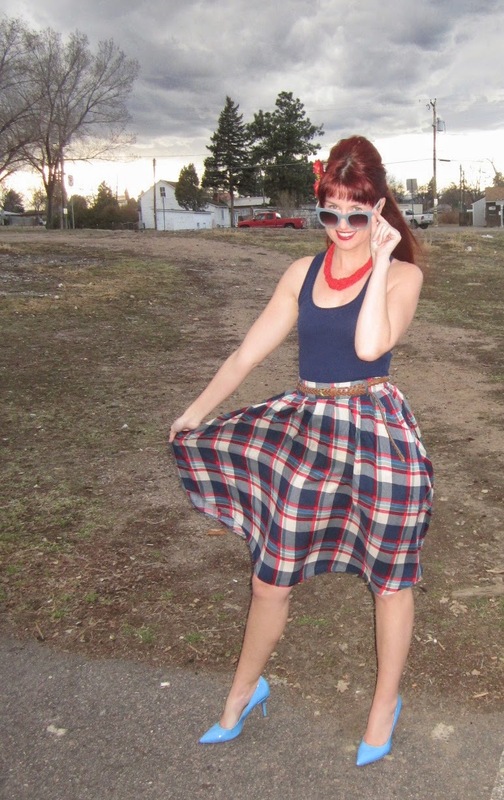 The reason being is that there's many cliches attached to the idea of plaid, ranging from school girl, slutty school girl, frumpy, goodie goodie, and old fashioned (in the non-fun vintage sense of the word). 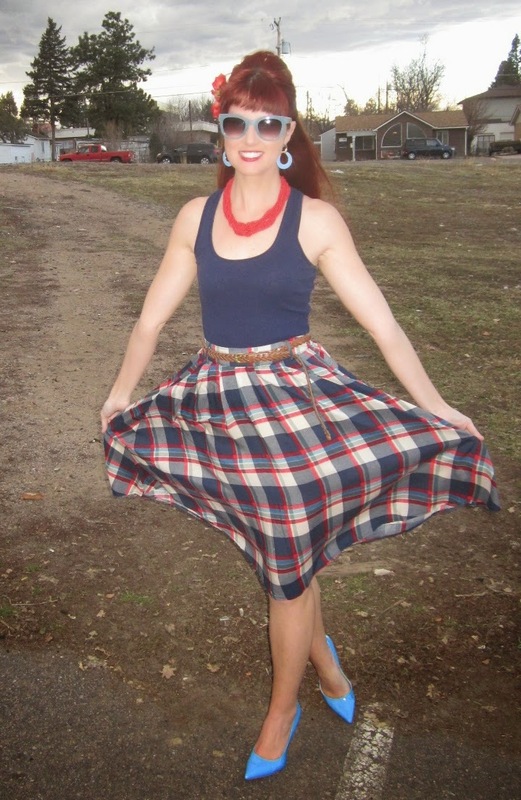 So when I do go for a skirt that's plaid it's usually off the beaten path color wise and something that will be a unique piece of clothing in my wardrobe instead of a tried and true classic. 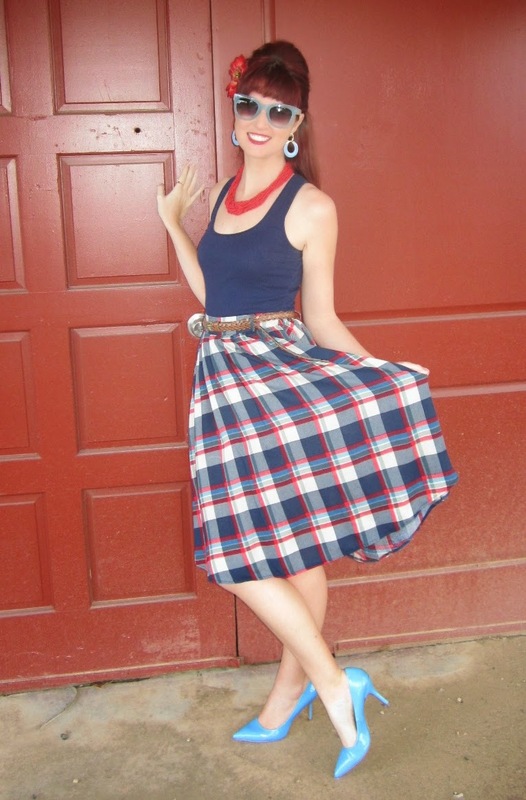 While reds and blues can be staples in plaid, I love how they're contrasted with grays in this skirt because it makes all of the colors pop out that much more! 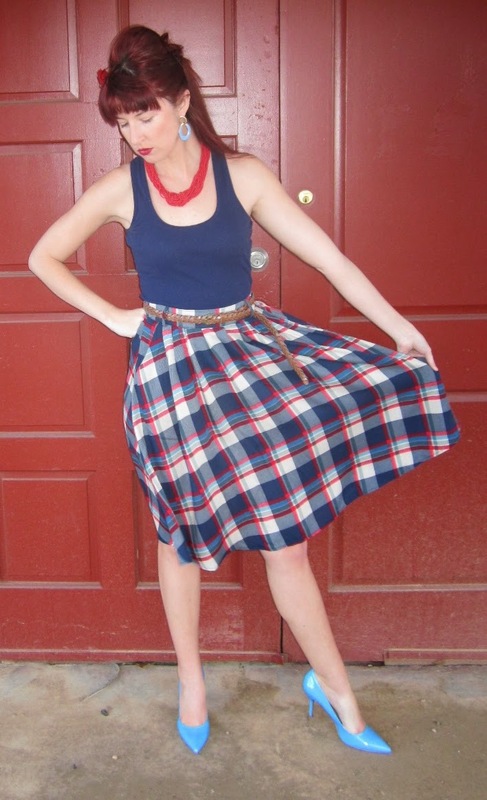 When I first saw the skirt pop up on ModCloth (and at 40% off at that!) I immediately clicked on it. I know I will love an outfit if I'm already brainstorming ways to style it before owning it, and I instantaneously had visions of pairing this with all black, varying blues, a gray tank with my gray wedges for an effortless but pulled together summer look! What was both comforting (and interesting) about this skirt that while zooming in on the skirt's details I immediately noticed it looked just like the skirts named Breathtaking in Tiger Lily that I have raved and reviewed about here. Having since updated my phone since making the purchase (my old phone was becoming limited with app functions and other such things) and also having logged into ModCloth via my computer, I noticed that they have the BiTL skirts listed under 'other hues' for this skirt. I'm not sure why they gave it a new name (Door-to-Door Delight Skirt) but it goes to show that paying attention to waistbands, zippers, structures, and fabrics can help identify what you're getting when you purchase online if you're not being led exactly to water. 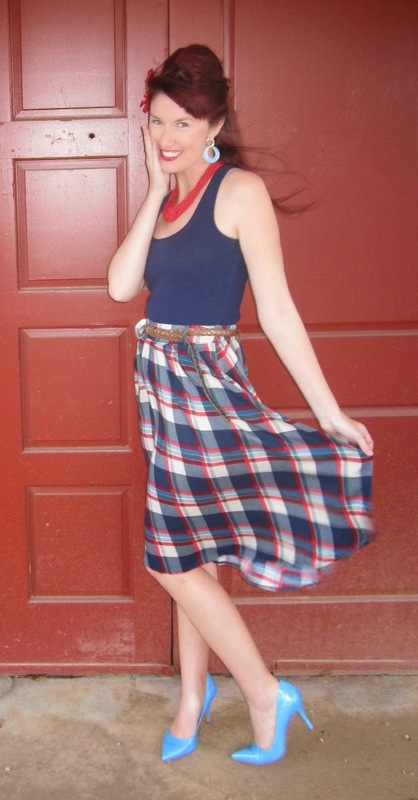 Feeling like this skirt was similar, if not identical, to the BiTL skirts made me confident enough to buy it because I knew my appropriate size and likely what kind of quality that I was getting. This was on a very windy day...! Cutie patootie! You look great! I don't have much plaid myself, just two Hell Bunny dresses. 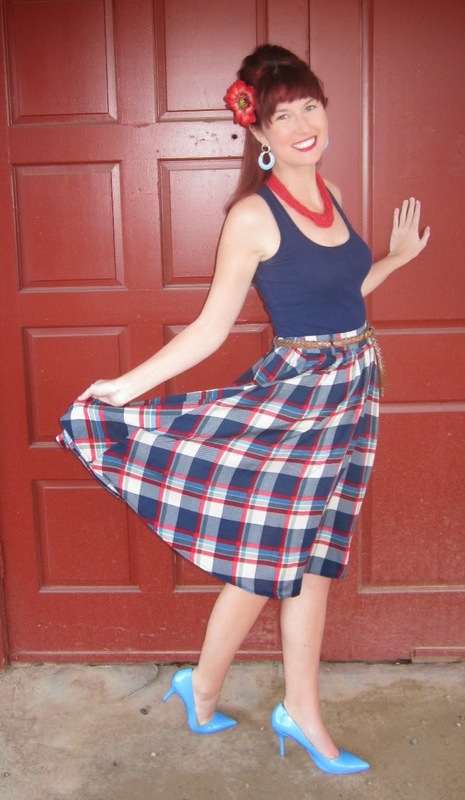 Wow, you look amazing in that plaid skirt and accessories...love it!! I know what you're saying though, plaid either works or it doesn't at all!